As a recent graduate of Windy City Harvest, I was exposed to a variety of agriculture techniques which give passionate and inspired individuals the knowledge and experience they need to break into the urban agriculture profession in the Chicagoland area. During the program, we learned a bit about aquaponics, and I’d love to tell you all about it. At least, as much as I learned from Windy City Harvest’s venerable Andy McGhee and my experience with his substantial system onsite. Andy gave us an hour-and-a-half lecture on the subject, with many follow-up conversations and discussions while working in the aquaponics area. First, where does the word “aquaponics” come from? Different forms of aquaponics are known to have been practiced since antiquity in Asia and Latin America, but in recent times, the term was coined in the Virgin Islands in the 1970s. Aquaponics is a blend of hydroponics and aquaculture. Hydroponics focuses on the growing of plants in nutrient solution without soil, while aquaculture is the raising of fish in pools for the sake of food. Both of these systems of food production, while innovative, are immensely wasteful. Hydroponics is costly, doesn’t have a good answer for what to do with plant waste water, and the systems are very susceptible to mold issues. On the other hand, aquaculture can be a big polluter; you are essentially setting up a feed lot for fish. Aquaponics, however, uses the waste nutrients from the plants to nourish the fish, and the waste from the fish to feed the plants. The aquaponics cycle is much more sustainable than keeping the two separate. With the exception of losing some water to plant respiration and evaporation, the water that initially fills the system, stays in the system. Thus, one of the top advantages to an aquaponics system is water conservation. In addition, you don’t need soil and the systems are incredibly adaptable and scalable. The only waste is a little solid waste from the fish. Andy gave us an example of a home-sized system, with a 10-gallon tank for acouple of fish and a plastic tub on top for the plants. This type of system can provide fresh basil, mint, bok choy, and some varieties of lettuce year-round. The initial set-up cost would be around $50 and that would pay for itself in no time. Once a system is set up, you become the grandmaster of a crucial balance of pH and nutrients. 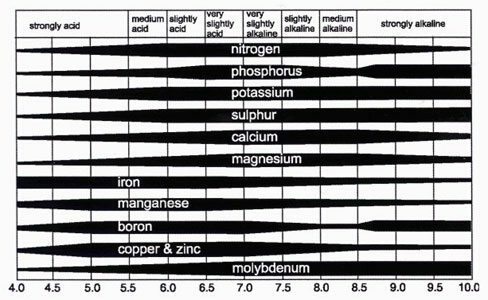 Andy showed us a really lovely chart that lists the ten most essential nutrients for plants and the pH at which they are most available to the plants in solution. The best pH for plants to access all the essential nutrients that they need is between 6.5 and 7. With any significant variation, the plants start to lose access to the nutrients that make them healthy. This is important for aquaponics, because while there are many plants out in the world that grow in acidic soil, fish don’t take too kindly to living in acidic water. I’m no biochemist, but the basic cycle is as follows: Feed fish. Fish exhale ammonia through gills. Ammonia is consumed by nitrosomona bacteria which turn it into nitrites. Nitrites are eaten by nitrobacter bacteria which convert the compounds into nitrates. Nitrates are the lovely nitrogen-rich compounds that make plants super happy. Most systems do produce some waste at this point, which can be collected in a filter and composted. The fish in large aquaponic systems are often tilapia, although koi is often used as well. Some growers who use aquaponics raise enough fish, primarily tilapia, to sell them to processing companies. It is difficult to do so competitively, however, since tilapia raised conventionally is done on a massive scale, often with environmentally questionable practices. On the other hand, koi can be sold more profitably as ornamental fish once they outgrow an aquaponics system. At Windy City Harvest, they have a bed system which has different plants rooted in coconut coir for aeration, sitting in puffed shale that has “red wriggler” composting worms living in it. The worms feast on the extra bacteria and waste from the fish, so the system itself has almost no solid waste. The other boon to this approach is the shale composing beds can support more intense root systems. In this sort of system, it is possible to grow tomatoes, hops, cucumbers, hot peppers, peas, and so on, making the whole system more profitable and/or delicious, depending on your perspective. Interested in learning how to construct your own mini aquaponics unit? If you have a flair for tinkering with pipes, fish, and plants, aquaponics might be a good hobby for you. Windy City Harvest will be offering a 14-week class Spring 2015 dedicated to the topic. This will be a thorough introduction to the topic with lots of hands on experience, and I can personally recommend the instructor. If you want less commitment, the internet is full of information to sift through. Determining factors in creating an aquaponics unit are how involved you want to get and how much of an investment you want to make. Why go through the trouble of assembling all the parts and risking the life of an aquatic animal? Well, first off, it is a worthy challenge, but not insurmountable. If you have a child looking for a science fair project, tracking pH and plant growth in an aquaponics system doesn’t seem like a bad idea. Second, I have been sitting here at my desk writing this article, all the time looking out the window being reminded that Chicago definitely does not have four growing seasons, unless you move inside. The aquaponics system at Windy City Harvest fits inside a two car garage. No one is asking you to give up your garage, but maybe a small portion of your living room could give you a little green this winter. Finally, if you are like me, growing makes you feel good. Takingcare of plants and sowing seeds to feed those around you—that feeds you, too. It’s going to be a long, cold winter; let’s not forget where our roots are in the midst of it. If you aren’t interested in building your own system, but you want to see aquaponics in action, The Plant has an inspiring system and regularly scheduled tours. If you just want to participate in eating local aquaponically-grown produce, you should check out FarmedHere. Their products, including basil, arugula, and other salad greens, are widely available in the produce sections at various local groceries. That is aquaponics in a nutshell. All in all, aquaponics is one cool way to keep local green things on the table year-round, when everything outside is grey and frozen. Spring will come again, but for now, we’ve got fish.